Crazy to think that Christmas is just around the corner! After ordering many prints from places like Wal-mart, I decided to print our large wedding picture with Shutterfly. It turned out lovely and the bright packaging was a great addition to the order. That was my first experience with the company, and because of my order I received multiple prints for free-what a deal! 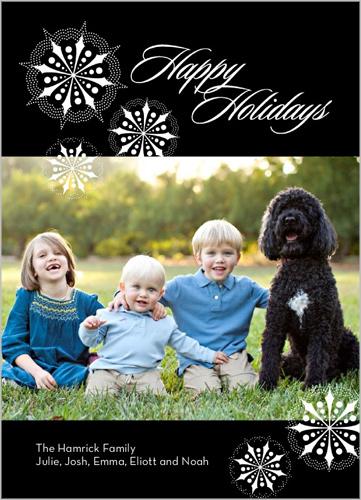 The other day I was reading my friend's blog and wrote a post on the Christmas card giveaway Shutterfly does for bloggers each year. This was quite exciting because I have been trying to decide what to do for our first Christmas card together. They so many different Christmas cards to choose from, I haven't decided which I like best. I always love the snowflakes and more simple cards. I also discovered they make Christmas cards that pertain to Christ as being the reason for the season. As I was browsing, I started to think about different Christmas gifts I plan making/buying for my family. I hate buying things that someone won't use or enjoy, trinkets drive me crazy! So I am considering ordering a calendar for my mother that she can enjoy all year. I have made the calendar through Wal-Mart before, but not as high of a quality, hence the difference in price. So this is the first time I have done the blogging for cards, I will let you know what I discover!